We first went to Igguthappa temple close to Kakkabe. Igguthappa temple is very sacred among the Coorgis. The temple priest actually told us the story of this temple. Padi Igguthappa temple is dedicated to Lord Subrahmanya. It is supposed to be more than a 1000 years old. The consciousness of God among the people was less in this area and so Subrahmanya swamy came in the form of Siva and imparted the knowledge of cultivation to the locals. The farmers worship this God for rainfall. “Iggu” means food and “thappa” is “to give”. God asked the locals to worship him and follow the rituals and said he will safeguard all the generations to come. The annual Coorg festival is celebrated here and every year people bring their children and contribute food in various forms (sugar, rice, coconuts etc) to the temple. The temple offers food to people everyday. After offering our prayers, we headed to Nalknad palace. 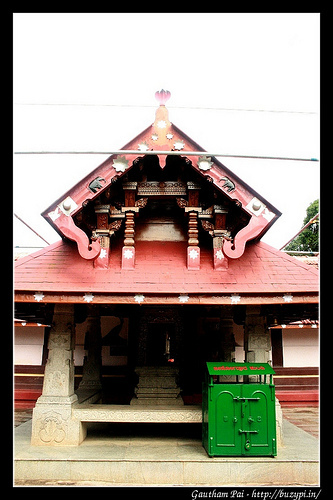 This temple is more than 200 years old and was built by Chikka Veerarajendra in 1792 – the last kind of Coorg. 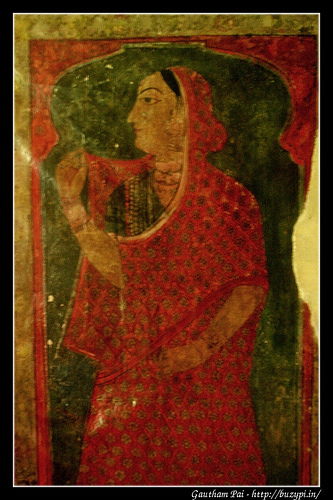 This palace has lost a lot of its original paintings due to people’s negligence. Miscreants have spoilt the place with their “graffiti”. 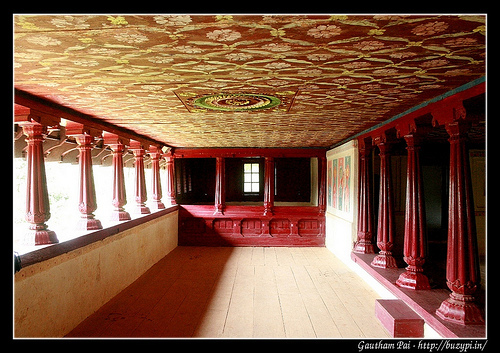 Then it was the shooting of a Kannada film – where they painted over the original paintings to suit their needs! Now this is a protected monument, they have a guard there and the place is closed after 7pm. Outside you see a small ‘mantap’ built for the king’s sister’s marriage. The guard acted as our guide and took us through the palace. The original painting is made by using a combination of herbs and flowers. 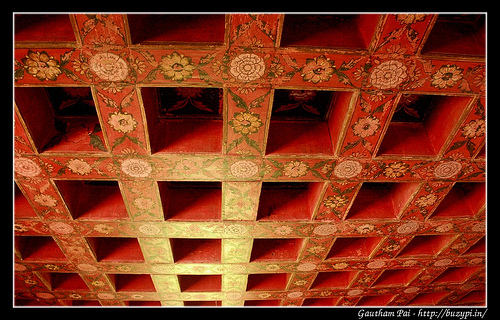 Only the roof paintings in the Raja’s ‘darbar’ is original. On one side is the queen’s room. There is a bathroom and a secret passage to a secret dark room which would be used to go in hiding in case of enemy attack. The secret room is dark at any time of the day. From here, we headed to Chelavara falls. It is a short trek to the falls from the point where you park the jeep. 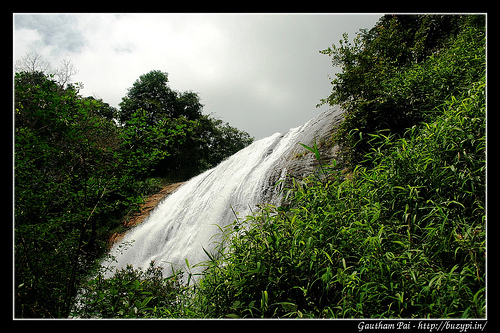 The road to Chelavara falls is not good, but the falls looks good both from a distance as well as from closeby. 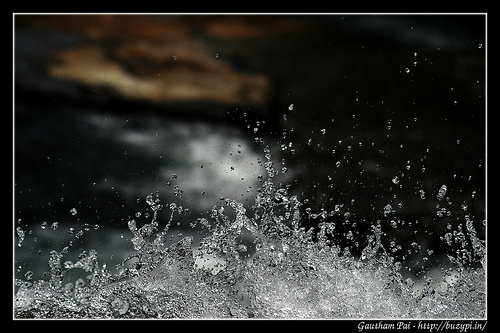 We can go to the bottom as well as top of the falls. It was afternoon by the time we went back to our hotel. Our earlier plan was to head back to Bangalore via the route we came, but our driver suggested we take the route via Nagarhole National Park and also cover Iruppu falls on the way. So we checked out and then headed towards Iruppu falls on the way back. 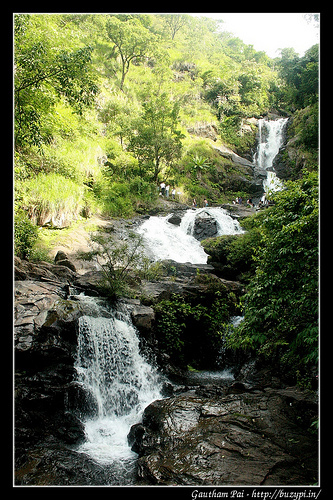 Iruppu falls is where Lakshmanatirtha river flows down and then joins Ramatirtha – which then joins the Cauvery river. The Malabar Banded Peacock (a butterfly) is a common sight here and this is supposed to be only limited to the Western ghats. This place was crowded and they have sort of commercialized this place. 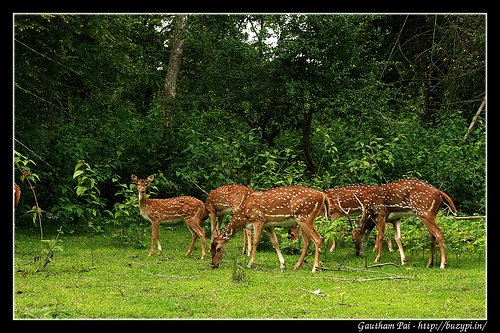 On our way back we came via Nagarhole National Park. This route of over 40km through the jungle was amazing – it was like a free jungle safari through the green, dense forest – we saw a peacock, lots of deers and a few elephants. The first elephant went into the bushes by the time we could pull our cameras out. The second group had also gone into the bushes but one of them was alarmed when it saw our car halt and it came out of the bushes and started chasing us and trumpeted loudly! The third group of elephants was drinking water from a pond very close to the exit gate. The only major rainfall we encountered during this entire trip until this point was in Bhagamandala and we were happy that our trip was a success. But as we headed back to Bangalore, we reached Srirangapattana and it started raining heavily. 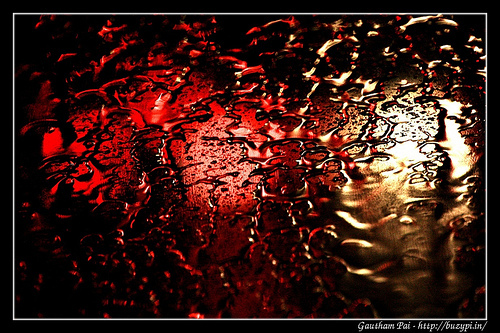 This rain was to follow us all the way back to Bangalore – and it was a mess. Overall it was an amazing trip and we covered more places than we had expected thanks to the surprise introduction of Nagarhole route by the driver.